Wow, another app that makes me want to update to 2.0! Thanks for the write-up. 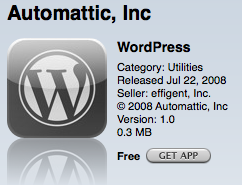 BTW, how does the WordPress App work around the lack of copy/paste? In other words, how do you insert links without having to type them all out? @Bernard Ramsey I don’t think there is a an option to insert anything from Safari such as a website- the “Press This” feature we know of in WordPress online. So, unfortunately you can’t do that. @tim It isn’t too hard, we run TheiLife off a hosted server obviously. If you follow the instructions on http://codex.wordpress.org/Installing_WordPress and post in the forums, you should have it up in running in no time! @tim Oh not a problem, all you have to do is login from the iPhone in the WordPress application regardless if you have a hosted or non-hosted WordPress blog! I’ve been using it for a good day now with no issues. Out of curiousity, what drives your hatred towards Microsoft? @Anthony Mallgren What hatred towards Microsoft? Who said we hated them? Did I misunderstand the following excerpt from the About page? Welcome to The iLife the blog of Matt Dodd, that crazy Apple fanboy/Google basher and Microsoft hater- but that would be stereotyping. Read the iLife for tutorials, podcasts, rants and general tech news, usually relating to Apple. And don’t let this generic description fool you, either! @Anthony Mallgren Oh. Haha. It was just joking really, that was just written on a whim one day. I’m no Microsoft enthusiast, but I do use Windows XP on my MacBook Pro. Do you like Microsoft?? 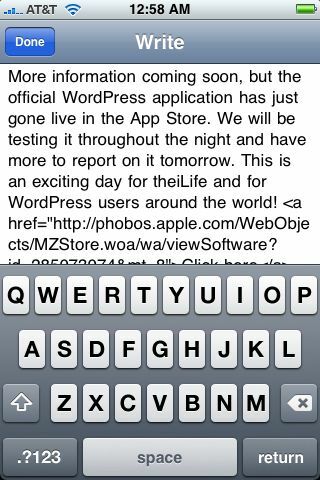 I also had the communication error with trying to connect the iPhone WordPress app to my blog. In my case, my iPhone was connected to my home network via wifi and my blog is hosted on the same home network. By typing in my domain name, I believe there was some sort of DNS issue resolving my public domain name locally. To fix it, I turned off wifi, connected through 3G and was able to connect to my blog. I put it back on wifi and it worked there as well! Hope that helps. I like Microsoft some tasks, mostly business intelligence and development, but I think Mac gives users a better user experience for the general consumer. I don’t really like one or the other, just trying to stay in tune with what other people like/dislike about the different Operating Systems and Development Platforms.